Eli Iserbyt is one of the legions of Belgian cyclocross racers to compete at the UCI level. 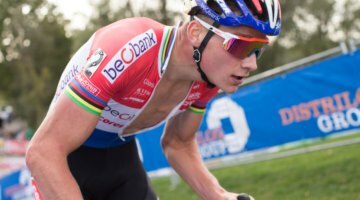 While he is only 21, his palmares include six Belgian National jerseys, two European Championships and two rainbow jerseys, including the one he won in Valkenberg in 2018. 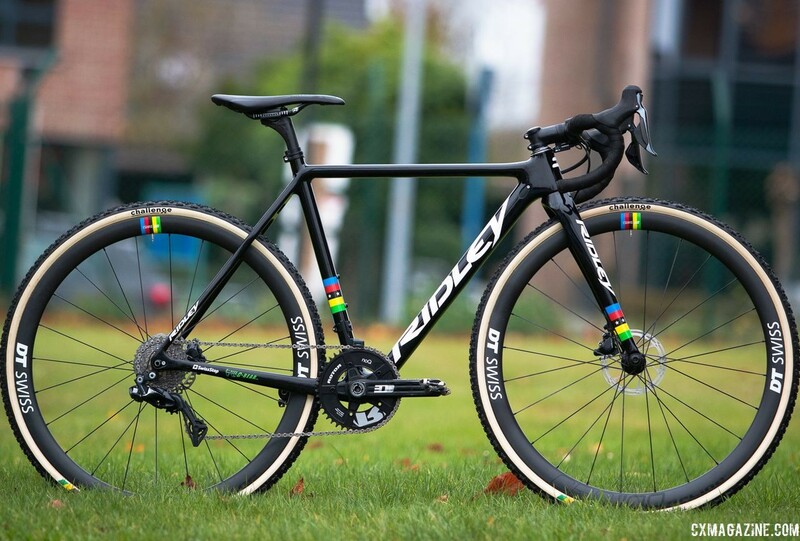 To celebrate his most recent U23 Worlds victory, his Marlux – Bingoal team provided him with a special world-champion-striped Ridley X-Night SL Disc, the same bike found under top riders like Marlux Bingoal teammate Michael Vanthourenhout and Marianne Vos of the WaowDeals Pro Cycling Team. Since Iserbyt often competes in the Elite field, however, this special bike sees more use as a spare than his primary race bike, because the UCI prohibits him using a world championship-themed bike when competing in a category in which he is not the world champion. 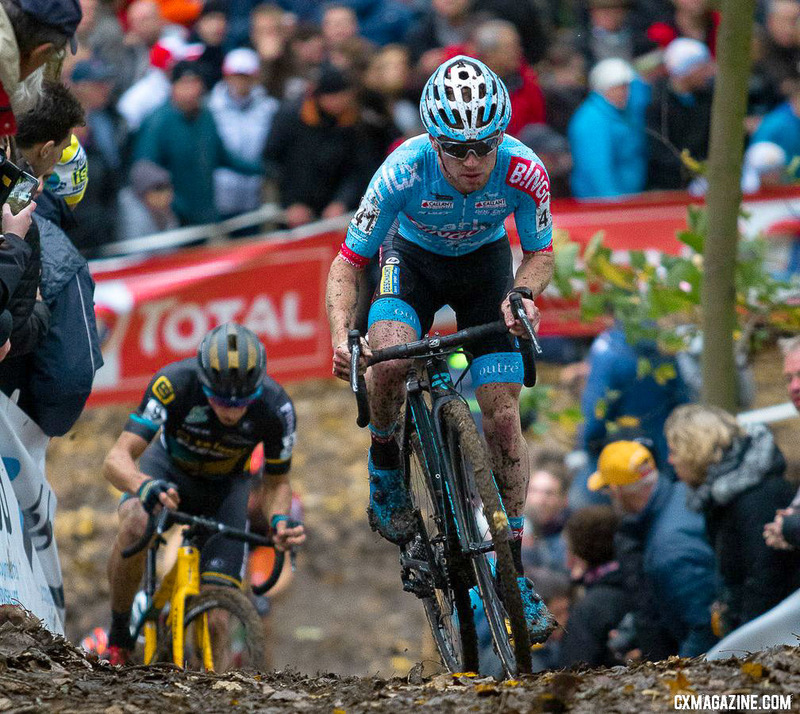 Cyclocross Magazine was in Belgium at Superprestige Gavere on Sunday. 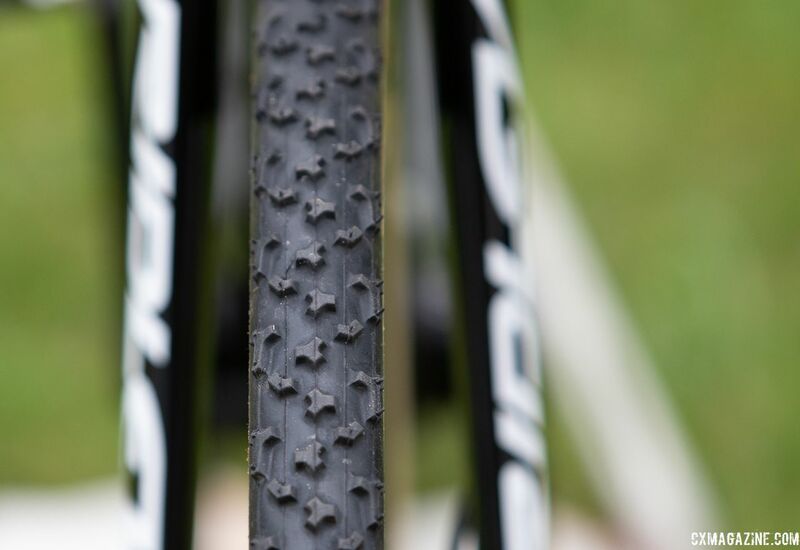 We took a closer look at Iserbyt’s striped X-Night SL Disc since it spent most of the weekend sitting unused in the pits while Iserbyt raced in the Elite contest there. 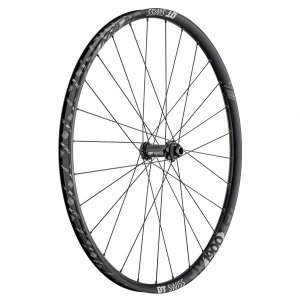 Iserbyt races the Ridley X-Night SL Disc, which uses the same mold as the X-Night, but features a higher-end carbon layup for a lighter frame of just 850g for a 52cm. Iserbyt’s complete bike as built weighs about 7.65 kg (16.9lbs). “The bike is light for a bike with disc brakes,” Iserbyt explains. 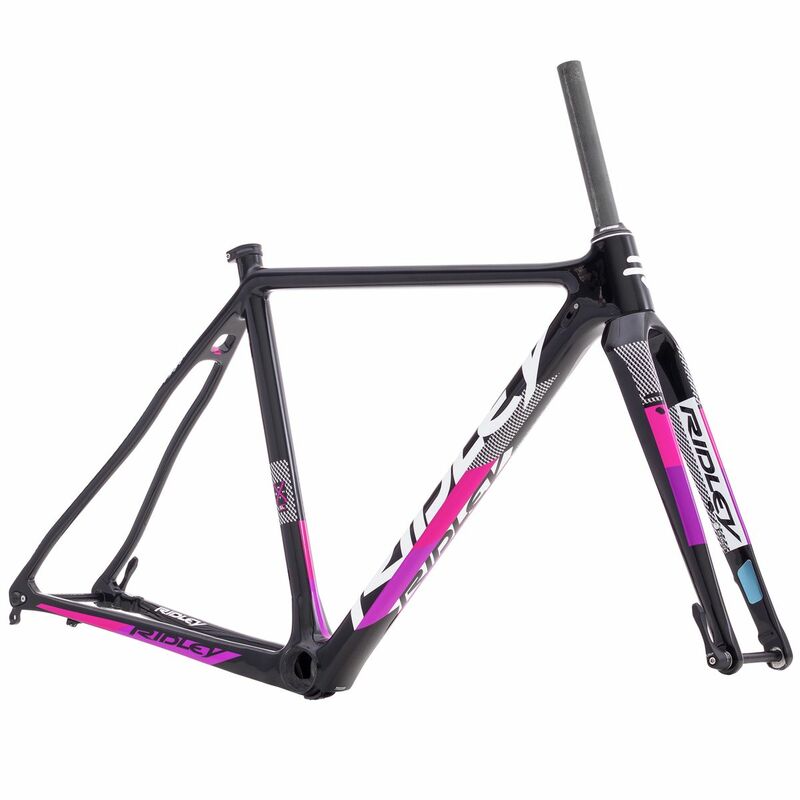 Iserbyt’s frame is 48cm, which is one of the smallest stock sizes available from any brand.  “Ridley thought about the smaller people,” Iserbyt told Cyclocross Magazine with a laugh. The frame, as is nearly standard in 2018, features 12mm thru-axles and flat mount brakes, as well as internal cable routing on the frame and fork. 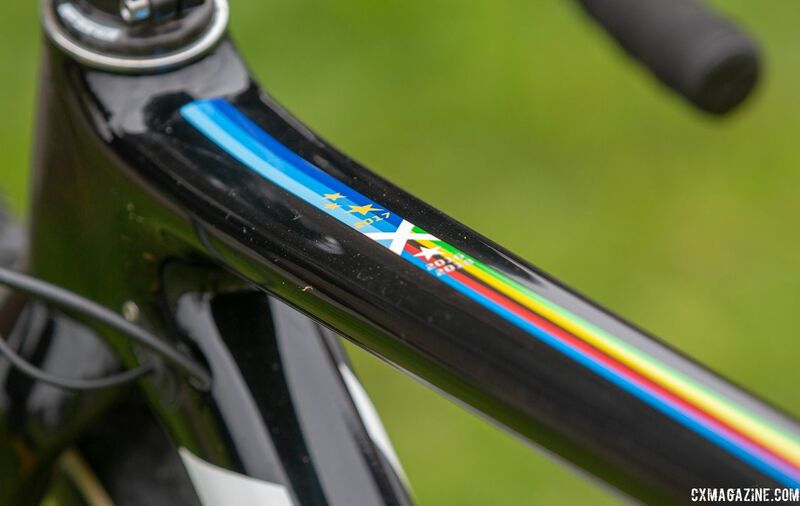 As a multiple-time World Champion, the frame features several rainbow bands to commemorate Iserbyt’s victories. The frame also carries the colors of the European Champion on the top tube since he has won the title twice, although just lost the title to Tom Pidcock a few weeks ago. 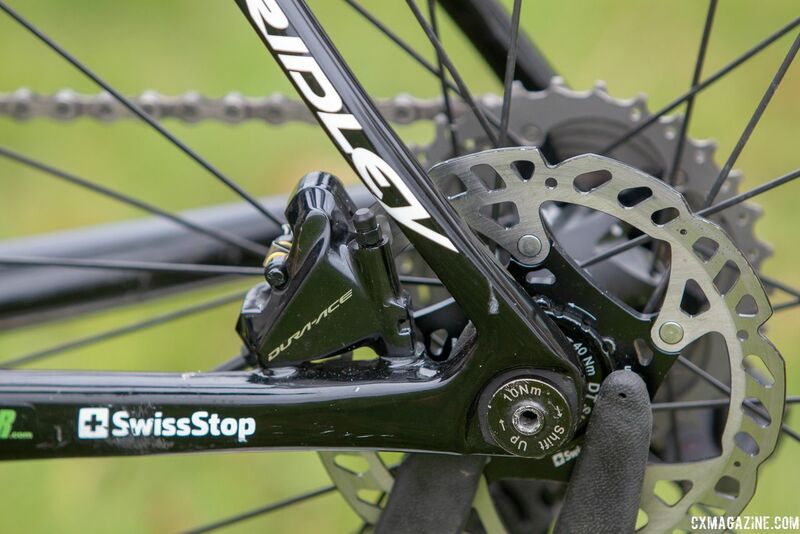 Iserbyt ran mostly Shimano components, including Dura-Ace Di2 R9170 shifters and brake calipers. 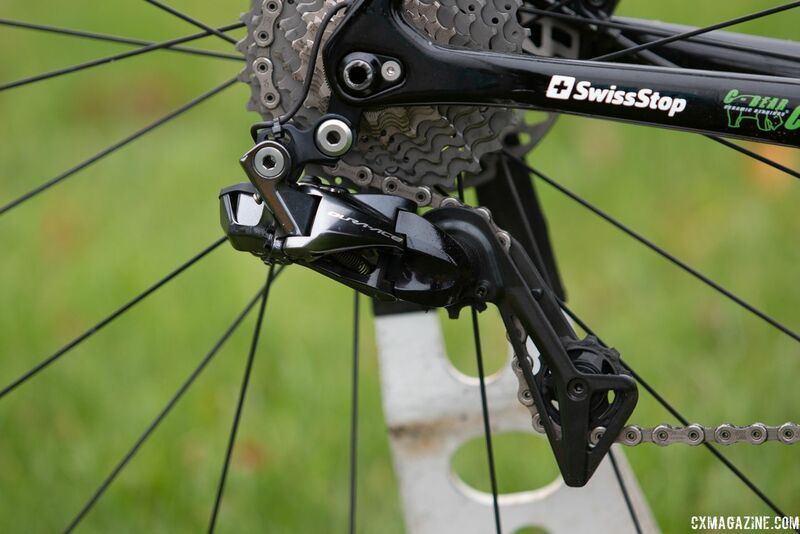 Swiss Stop provides the Marlux – B!ngoal team with brake pads, which Iserbyt has now run for two years. 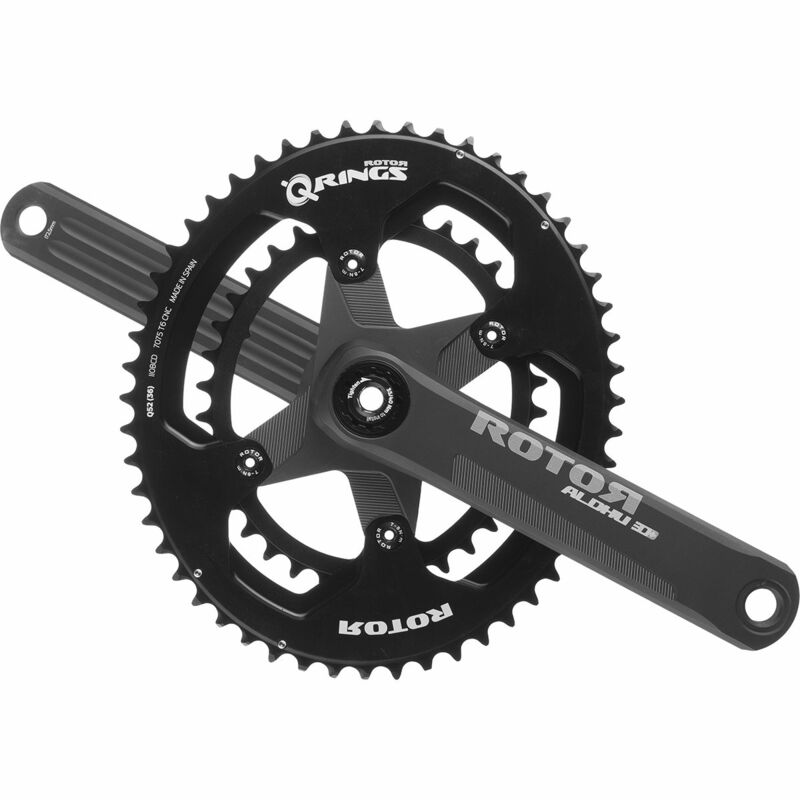 He opted for a Swiss Stop rotor in the rear and then chose a SRAM Centerline rotor for the front. 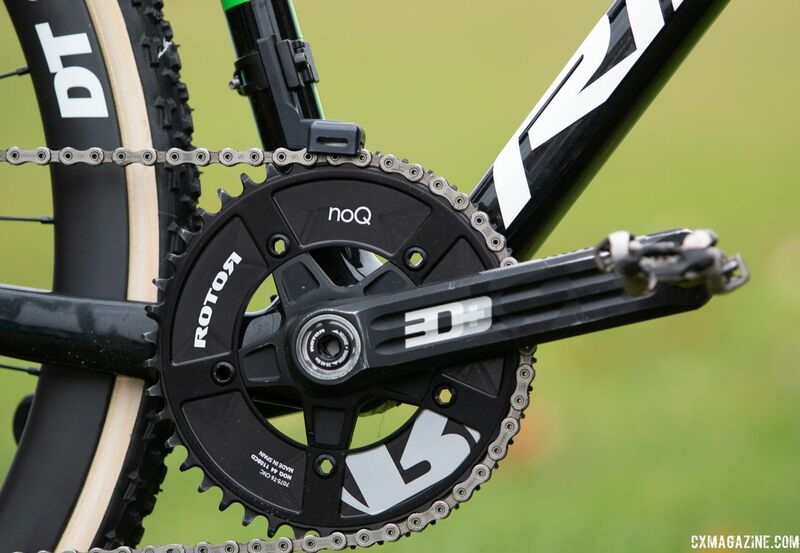 Up front, Iserbyt used a Rotor 3D+ crank with a noQ 1x chain ring. 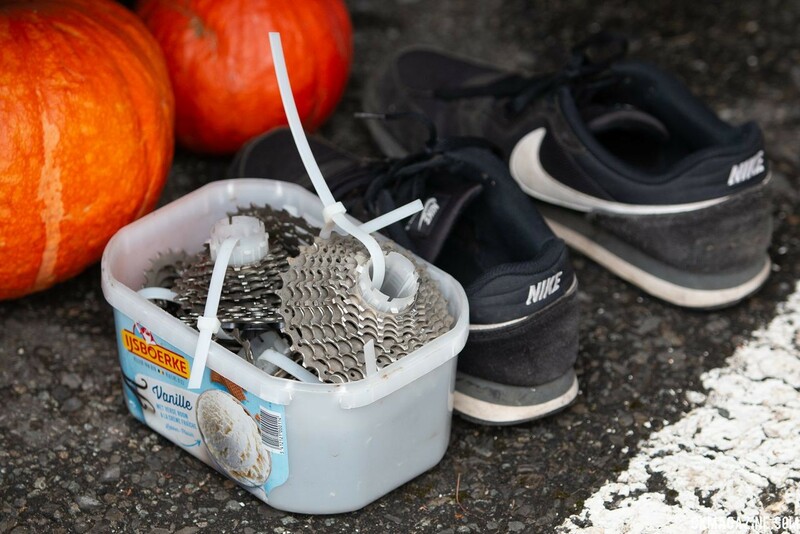 Depending on the course conditions, he routinely swaps between 42t and 44t chain rings and will also use either an 11-28t or 11-30t cassette. When we looked at Iserbyt’s world championship-striped bike before Gavere, he had a 44t ring on, but his dad then swapped in a 42t for a lower gear on the climbs and muddy slogs. 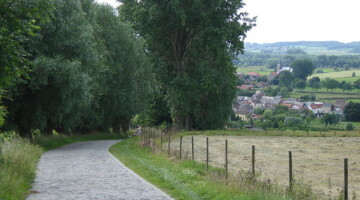 A chain keeper sits in place of the front derailleur. 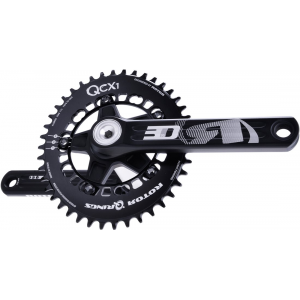 His rear derailleur was a Dura-Ace RD-R9170, even though the clutch mechanism on the Ultegra RX805 derailleur would seemingly be a good fit for his 1x setup. 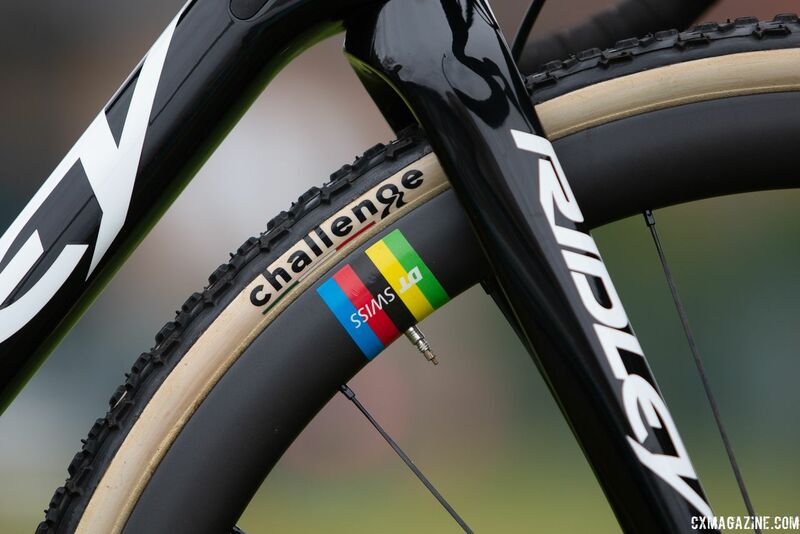 As a Challenge Tires-sponsored rider, Iserbyt combatted Gavere’s mud with Limus Team Edition S tubulars which were adorned with special World Champion stripes and glued to DT Swiss carbon wheels, which also featured rainbow stripes. 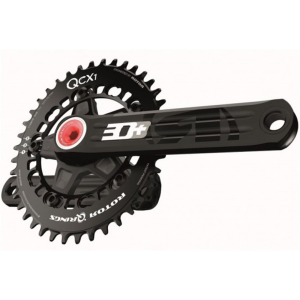 Other Marlux-Bingoal teammates had similar Shimano/Rotor specs, but some raced a double chainring setup and opted for other brands’ tubulars. 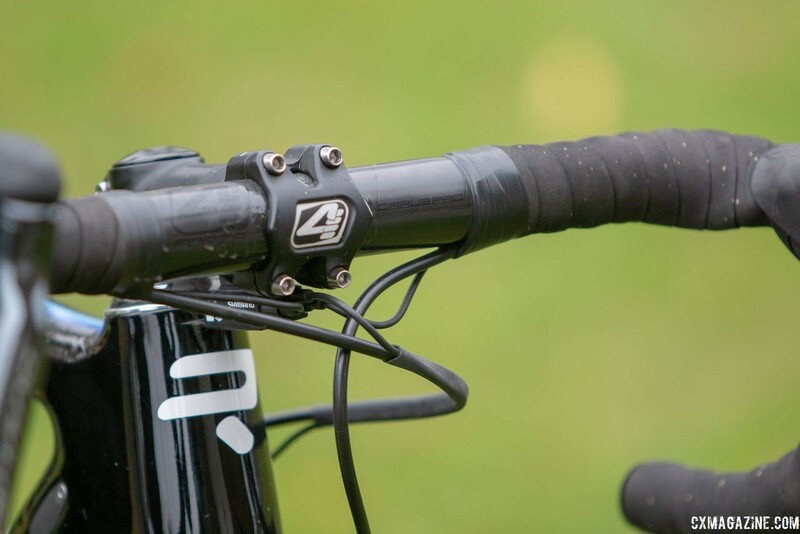 Touch points were provided by Ridley house brand Forza, with a carbon seatpost, saddle and handlebar from the Cirrus Pro line and an alloy Forza Cirrus Pro stem. Iserbyt used Shimano XTR M9000 pedals. Perhaps an insight into Euro racing, Iserbyt’s program is a family affair. While the team mechanic handles the majority of the bike’s service, Iserbyt’s father is responsible for gearing adjustments throughout the season and helps with bike washing. His mother was busy in the team camper, cooking a pre-race meal, while Eli’s brother Oliver also helped out at the races, and for several seasons, he has put together highlight videos of his brother’s racing. For more on Iserbyt’s bike, see the photo gallery and full specs below the slider. curious about both shifters being wired up to junction box A… obviously without a front derailleur, the left shifter would be useless. unless he re-configured the rear to shift eTap style?